Low-grade intersections include 77m @ 0.4g/t (OJD031), 37m @ 0.5g/t (OJD028) and 49m @ 0.7g/t (OJR210 – 2017). VANCOUVER, British Columbia, April 16, 2019 (GLOBE NEWSWIRE) -- Osino Resources Corp. (TSXV: OSI, FSE: RSR1) ("Osino” or the “Company”), announces drill assays which extend gold mineralization at the Goldkuppe project located 20km to the northeast of the Company’s flagship Twin Hills gold project (“Twin Hills”), in the Karibib region of Namibia. Osino drilled 14 core holes during November and December 2018 for a total of 2550m at the Oasis and Wedge targets to the south of Goldkuppe (refer to Figure 1 below). Wide zones of gold mineralization were intersected in several holes at Oasis, with best intercepts of 77m @ 0.4g/t (OJD031), 37m @ 0.5g/t (OJD028), and 37m @ 0.4g/t (OJD027). This mineralization is contained within sheeted quartz-pyrite veins associated with faulting and folding in the banded marble host lithology. These sheeted veins, which have a fairly consistent distribution and grade throughout the mineralized package, strike north-south and dip moderately to the east. This style of gold mineralization is typical of the multi-million ounce Navachab Gold Deposit 30km to the southwest. The 2018 drilling was a step-out program from the initial scout drilling conducted during December 2017, which returned best gold assays of 49m @ 0.7g/t (OJR210) at Oasis and 10m @ 2.0g/t (OJR215) at Wedge. The 2018 program was aimed at delineating strike extensions and obtaining data on the structural and lithological controls on mineralization. Assay results were delayed as a result of a potential coarse gold issue, requiring re-assaying and confirmation with screen fire assays. Initial results of the check assays indicate the majority of the gold at Oasis is in the coarse fraction and further analytical and statistical work in this regard is on-going. This early test work was initiated as coarse, free gold forms a large proportion of the total gold of another Damara-hosted gold deposit (Otjikoto) which presented not only a metallurgical opportunity but also a resource grade estimation challenge later in the development cycle. The 2018 results extend the Goldkuppe mineralization by 2km to the southwest, adding scale and proving that the gold mineralization extends into the banded marble which forms the footwall to the dolomitic marble. The low-grade sheeted vein mineralization in the banded marble footwall indicates potential for a larger scale, bulk deposit upgraded with the Goldkuppe style high-grade shoots. An updated structural interpretation of the ground and airborne magnetics along with satellite imagery was carried out in January 2019. The areas of better mineralization are associated with north-south or north-north-east faults which appear to be acting as pathways for hydrothermal fluids (refer to Figure 1). The most prominent of the north-south structures forms the Goldkuppe Hill, characterized by intense iron and silica alteration, which has seen very little drilling in the programs to date. Future drilling will focus on the north-south structures, including deeper drilling under Goldkuppe Hill as well as the area between Oasis and Goldkuppe Hill. For the rest of 2019 Osino will focus on advancing Twin Hills and the Karibib Fault trend to the south west of Twin Hills. The company has planned a RC/DD drill program at Twin Hills and on-going calcrete and bedrock sampling along the rest of the trend. Osino will also continue to advance the Otjikoto East targets and initiate the Otjiwarongo regional, generative exploration program. The company also announces a correction of its news release dated February 21, 2019. Whereas the previous news release stated that the payment shares issued pursuant to the acquisition of EPL5897 and EPL5563 would be subject to a voluntary 3-year escrow agreement, this has been amended to a voluntary 2-year escrow agreement instead. All Osino sample assay results have been independently monitored through a quality assurance / quality control ("QA/QC") program including the insertion of blind standards, blanks and duplicate samples. QA/QC samples make up 10% of all samples submitted. Logging and sampling are completed at Osino’s secure facility located in Omaruru near the Goldkuppe project. Drill core is sawn in half on site and half drill-core samples are securely transported to the Actlabs sample prep facility in Windhoek, Namibia. The core is dried, crushed to 95% -10mesh, split to 250g and pulverised to 95% -150mesh. Sample pulps are sent to Ontario, Canada for analysis. Gold analysis is by 30g fire assay with AA finish and automatically re-analysed with Gravimetric finish if Au >5 g/t. In addition, pulps undergo 4-Acid digestion and multi-element analysis by ICP-AES or ICP-MS.
David Underwood, a Chartered Professional Geologist (SACNASP) and a Qualified Person for the purposes of National Instrument 43-101 Standards of Disclosure for Mineral Projects for the Karibib Gold Project, has reviewed, verified and approved the contents of this news release. Osino Resources Corp. (TSXV: OSI) is a Canadian company, focused on the acquisition and development of gold projects in Namibia. Osino’s Namibian interests comprise 22 exclusive prospecting licenses located within the central and northern zones of Namibia’s prospective Damara belt, mostly in proximity to and along strike of the producing Navachab and Otjikoto Gold Mines. Osino is currently focusing its efforts on developing the Karibib Gold Project and defining new exploration targets in the Otjikoto East area and on our other licenses. 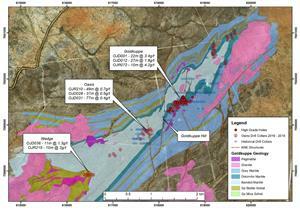 The Karibib Gold Project is located approximately 130 km north-west of Namibia’s capital city Windhoek. By virtue of its location, the projects benefit significantly from Namibia’s well-established infrastructure with paved highways, railway, power and water in close proximity. Namibia is mining-friendly and lauded as one of the continent’s most politically and socially stable jurisdictions. Osino continues to evaluate new ground with a view to expanding its Namibian portfolio.